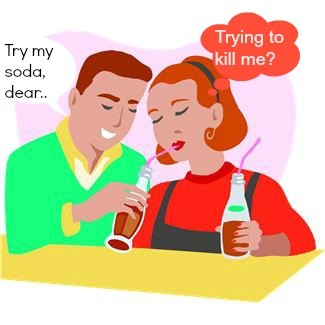 For the past few years, there is much awareness on the ‘danger’of soda –even celebrities are more mindful of endorsing soda brands (google Beyonce, Scarlett Johansson and Taylor Swift)! Sugar, which is a key ingredient in soda drinks, is inflammatory and well-known nutritionists like Rania Betayneh and Toby Amidor had offered tips on inflammation in this blog. Every time I see someone close to me buying a sugared drink (or for that matter, when I buy a sugared drink myself! ), I always joke about ‘Here’s the inflammatory drink!’. Lately an acquaintance who loves soda had recently been diagnosed with a terminal chronic condition which led me to start looking at soda again. If it’s REALLY (Truly Bluely as my 5-year old daughter would say) BAD for health, we as parents would not want our child to consume soda. So, let’s review the effects on general health in this 3-week soda and our kid series, with the last post with a focused on possible effect on allergic conditions. #1 Sugar – Sugar is empty calories and linked to obesity, which in turn is linked to a whole host of chronic diseases. It is also linked to increased risk of pre-diabetes (something to watch out for even for adults), metabolic disorders and heart disease which have symptoms like big waistline, high blood pressure and low HDL/good cholesterol. More recently, sweetened drink has been linked to behavioral issues in children, with issues like aggression, depression and attention difficulties. As to which ingredient causes it, it is not clear but caffeine, acids, HFCS and sugar had been hypothesized to be behind the behavioral issues. But can all the health problems be blamed on sugar? The case made by soft drink companies/associations is that soft drinks should not be picked on for the rise in obesity and it is true to some extent – the additional 100-200 calories from a can of soda may not contribute to material weight gain, what is contributing is that because it doesn’t make your child feel full, thus there is a tendency to not reduce overall calories intake. The additional (empty) calories from soda can become truly weight-gaining unless one makes a conscious effort to exercise. Next week, we will be going through the other ingredients in soda drinks and learn the other possible effects on health of our children!